How can observing a painting help students understand life in America in the early 1800s? Making observations about a painting or drawing encourages students to slow down and really look with their eyes. From close observation students can then use skills of making inferences to think critically and draw conclusions about the past. Students will describe what they observe while looking at a painting by Fitz Henry Lane. Students will discuss and record observations on a chart. Students will make inferences and draw conclusions about life in a maritime port in America in the nineteenth century. Students will apply and demonstrate their understanding of life in a maritime port by choosing one object in the painting and writing about its significance in America in the early 1800s. Please note: it is recommended that the teacher preview the site including the paintings, interactive features and historical materials for the lesson in advance. This procedure can be used to examine most of the paintings in the catalog. Explain to the class that in today’s lesson they will be examining a painting by Fitz Henry Lane and related primary and secondary sources from the time period. The purpose of the lesson is for them to learn as much as they can about life in nineteenth-century Gloucester. Explain that when they are done examining the painting closely, they will be choosing one vessel, landmark or building to research and write about. Access Fitz Henry Lane Online from your classroom computer. 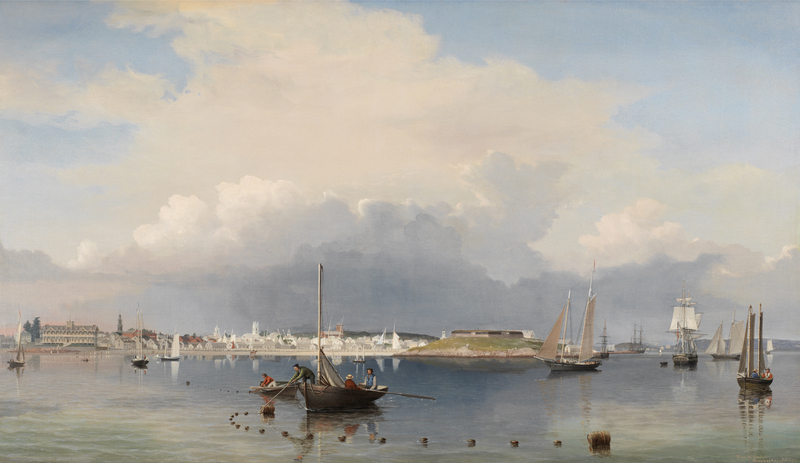 Find the painting Gloucester Harbor, 1852 (inv. 38) to display on the smart board or ask students to do the same using their own personal devices. Use your cursor to zoom in and around the painting. If possible, have a student take your place to navigate based on their classmates’ directions. For 5-10 minutes, discuss the class observations out loud. Students should closely observe the painting, focus on key details and think about their personal response to the painting. What do you think is happening? Why? The Visual Thinking Strategies line of questioning may also be used. What is going on in this painting? What do you see that makes you say that? What more can we learn? Place students into small groups and distribute worksheets. Ask them to work cooperatively to record their observations, focusing on both objects from the land and harbor. Students should be encouraged to speculate about the artist, the painting and the context in which it was created. As they discuss the painting in small groups they should complete Worksheet 1. Access the interactive feature on the lower right of the screen, as well as the related Historical Materials section, to find the answers to questions. Record the answers that are found on the “I know” column on the chart. It’s likely that some of the students’ questions will not be answered on the site. Encourage students to think about other places to find the information. Students will conduct independent research about one characteristic of the painting that they want to learn more about. Using the completed chart as a launch pad, students will research the answer to the question: What role did this particular vessel, landmark or building play in a maritime port in America in the early 1800s? Students will write an informative text to answer the question. Students may contemplate the changes between nineteenth-century America and America today by comparing Gloucester then and Gloucester now. Students may continue the research of their “vessel, landmark, or building”, finding out what happened to it in the twentieth century and reporting on its status today. VA: Cn11.1.4a: Through observation, infer information about time, place, and culture in which a work of art was created. Conduct short as well as more sustained research projects to answer a question (including a self-generated question) or solve a problem; narrow or broaden the inquiry when appropriate; synthesize multiple sources on the subject demonstrating understanding of the subject under investigation. Students will ask and find answers to questions related to the past in school, community, state and regional contexts; Students will use a variety of sources to learn about the past. The origins and impact of sectionalism on American life and politics. The U.S. history standards in grade 5 and the standards for U.S. history I and II address the origins, development, and importance of sectionalism in American history. The standards address the political and economic differences between the North and the South, the Civil War and its aftermath, and the continued importance of sectionalism through the twentieth century. Citation: "Exploring the Past through an Artist's Eyes." Fitz Henry Lane Online. Cape Ann Museum. http://fitzhenrylaneonline.org/resources/for_teachers.php?name=Lesson%20Plan%201C:%20Grades%209-12 (accessed April 22, 2019).